Anyway, I purchased some new Maybelline items last month. It feels like already years since the last time I bought Maybelline product. Since I moved my heart into Korean products, I kinda neglect my first love hahahaha. Maybelline is one of my favourite drugstore brand and I love the products so much! Today I will talk about their Hypershine Eyeliner. 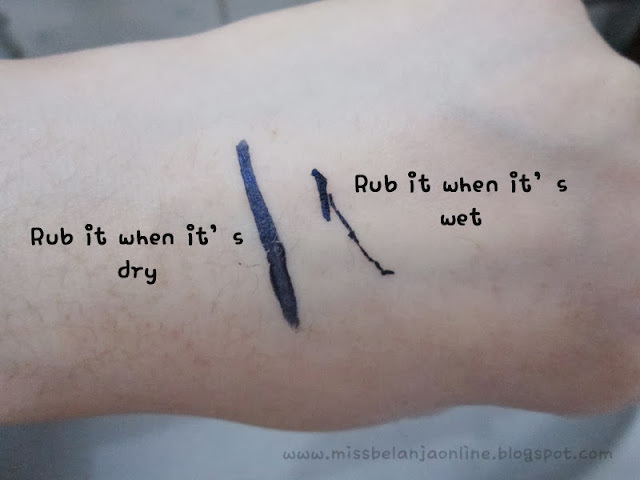 Maybelline liquid eyeliner is one of my HG eyeliner cause the staying power is super awesome. Now, they have a new range for the liquid eyeliner with many cute color. I choose navy color because I'm not confident enough to wear colorful eyeliner hahaha. Maybe later I will re-purchase the other colors. The navy color is dark blue - almost black - color. With shiny effect after it completely dry. The packaging is a super small bottle with super thin brush applicator. Well, Maybelline always comes with tiny packaging when it comes to liquid eyeliner *as far as I know*. It is waterproof (just don't rub it when it still wet), smudgeproof, and whatever proof you want to hear. Yes, it is awesome! like I've said before, the staying power is great even for those who have monolids like me. Bottom line~ I always love Maybelline liquid eyeliner. I remember it was the first liquid eyeliner that I used back then. Now that they have many different color of it, I'll make sure to try the other color as well. Aku jg baru beli hr rabu kemaren. Yp blm nyoba. Abs baca repiuw cc jd pgn nyoba XD oiaa ce namany hyperglossy kan?